Table Rock is loved by many people for a variety of reasons. It''s clear water makes it popular among scuba divers for diving, it''s clean waters is perfect for swimmers, skiers and tubers, jet skiing and kayaking along it shores, camping on it''s rocky banks, cliff diving and just cruising. Then there''s the fishermen! One of the premiere bass lakes in the country--best smallmouth and largemouth, and home of the state record spotted bass. Crappie, white bass and walleye round out the group along with some of the biggest and feistiest blue gill and goggleye around. 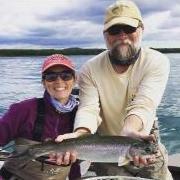 Fishing reports for Table Rock Lake from anglers who frequent Ozarkanglers Forum.